A man who blocked a Slocan Valley logging road in March has received a 14-day conditional sentence and 18 months probation. Dennis Zarelli, 37, admitted to criminal contempt of court when he appeared before BC Supreme Court Justice Mark McEwan today. 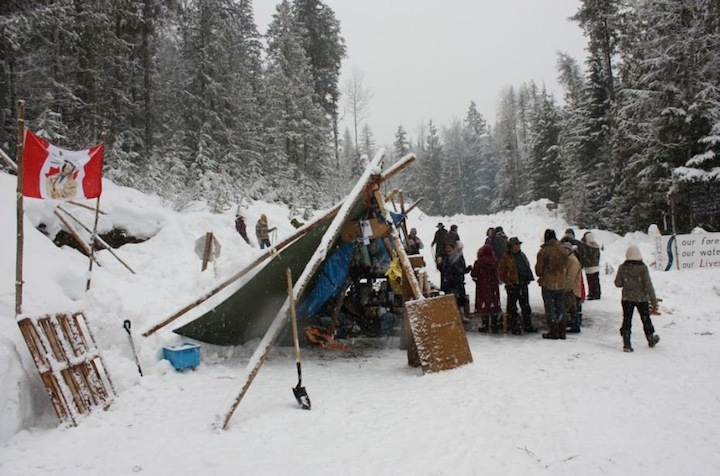 He was arrested along with Marilyn James on March 4 on a Perry Ridge logging road after Galena Contracting, which has a contract with BC Timber Sales to extend the road, obtained an injunction against protesters. Zarelli and James say they were trying to protect cultural sites of the Sinixt First Nation. Today’s sentence was the result of a joint submission by Crown and defence that called for 14 days in jail plus 18 to 24 months probation. However, if Zarelli abides by his conditions — including staying away from the logging road — he can serve his sentence under house arrest and won’t be required to spend time behind bars. Crown prosecutor Debra Drissell played a short video of an exchange between Zarelli and James and Galena’s Ray Hascarl at the gate to the logging road. She said Zarelli’s “public defiance” was an aggravating factor, tempered by his admission of guilt and personal circumstances. Court heard Zarelli has been raising his five-year-old son by himself after his common-law wife died the day he was arrested — something he didn’t learn of until his release. Zarelli’s lawyer, Don White, said Zarelli has “paid in a deep and emotional way for his actions already. It’s been a difficult haul.” White said Zarelli “took full responsibility” for his actions and “was polite and respectful” in the encounter with Hascarl. There was no physical violence, Zarelli did not chain himself to anything, and he was co-operative during his arrest, White added. White said Zarelli has “decided to live his life in poverty and assist others” and is “an adopted member of the Sinixt.” He was born in Victoria, where his parents still reside, and has lived around Winlaw and Vallican for the last four years. His wife owned property on Perry Ridge, which brought him to the area. As the Sinixt communications liaison, he has written “thoughtful and respectful” letters to government and “prepared legal arguments based on international law to advance the Sinixt position,” White said. He also said Zarelli has assisted local Sinixt with berry picking, documenting archaeological sites, and doing pithouse tours for local students. He hopes to get further archaeological training. 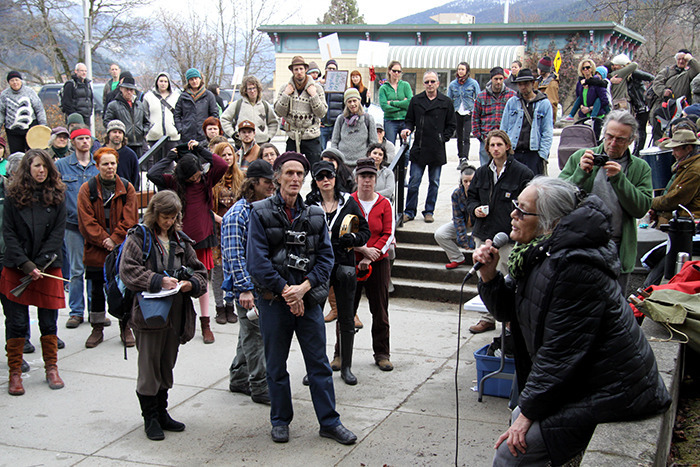 White submitted a letter of reference on Zarelli’s behalf from Selkirk College anthropology professor Lori Barkley. White further said Zarelli isn’t a risk to reoffend and has abided by the court order to stay away from the Perry Ridge road since his arrest. In sentencing, McEwan lectured Zarelli for violating the court injunction and for arguing with him in court immediately after his arrest. Zarelli and James were initially remanded in custody after refusing to agree to stay off the road, but changed their minds later that evening and were released. He dismissed a letter Zarelli submitted to him as “legal gibberish. I am concerned where you are getting your information. You can’t exempt yourself from the law by calling yourself a natural person. You can’t play games or try to run the court. Your breaches in the courtroom were almost as bad as your breaches out of it,” McEwan said. McEwan declined to impose community service as part of the sentence after hearing Zarelli is constantly volunteering. “You spend your life doing some form of community service,” he said. Marilyn James, who is also accused of criminal contempt, is expected to return to court on Monday. She is fighting the charge. Posted on May 22, 2014, in Logging and tagged BC Timber Sales, Dennis Zerelli, Galena Contracting, logging blockade, Marilyn James, Sinixt. Bookmark the permalink. 2 Comments.